Spain is vibrant, alive, warm and welcoming. 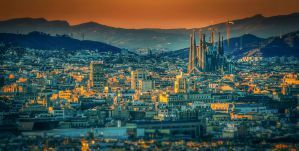 As one of the biggest cities in Spain, Barcelona has grown to be a central meeting point for travelers, expats, students and of course the Spanish themselves. With its cosmopolitan feel, relaxed pace of life, breathtaking architecture, fantastic gastronomy, and unbeatable climate, it really is the city that has everything. Antoni Gaudi is a famous artist with most of his work in Barcelona. Some of his most popular pieces to visit include Sagrada Familia, Park Guell, La Pedrera and Casa Batllo. To fall in love with Barcelona you need to come and feel it, meet its people, live its streets and get the local vibe. To live like a local, you only need to relax and enjoy little things, from trendy exhibitions, cold beers, tapas on rooftop terraces and folkloric festivals. Barcelona is known as a city that never sleeps, well except for the sietas. But the nightlife here is absolutely crazy, with hundreds of bars and clubs to choose from every night of the week. Need to cook your own food? These hostels in Barcelona have kitchens. Sant Jordi Hostel Rock Palace is the Rock Hostel of Barcelona! Dedicated to Rock Music of all ages it is a designer hostel in Downtown Barcelona with modern facilities, an ideal central location, fun atmosphere and great services. The hostel has a rooftop swimming-pool open from April to October, a famous bar, lively common areas opened 24 hrs, a guitar collection, WiFi everywhere in the building, guest computers free of charge, soundproofed rooms designed for optimal comfort, a huge fully equipped guest kitchen and spacious bathrooms. Rooms are mixed dorm of 4 to 14 beds, with ensuite or shared bathrooms. All rooms include large lockers designed to fit big backpacks. Each bunk bed has an individual reading lamp, storage cupboard and outlet for charging electrical devices. Sant Jordi Hostel Rock Palace provides fun party nights out in Barcelona and their staff is friendly, helpful and well informed. The hostel also features free city maps, key card access, air conditioning, books for exchange, cable TV and DVDs, hair dryers, laundry facilities, towels for hire, luggage storage, 24 hour reception, tea and coffee making facilities. Sant Jordi Alberg is located near Passeig de Gracia as well as Las Ramblas, Barcelona&apos;s Cathedral and the nightlife of the Barri Gotic. In the neighbourhood you will find some of the best markets, bars and restaurants in all of Barcelona and you are less than a 15 minutes metro ride from the beach. Hostelworld guests have said this is ‘a great place to stay if you are looking to meet people and party in Barcelona’. It is more of a family house than a hostel, as everybody gets to know each other, the atmosphere is awesome and in the night-time the party breaks loose. As part of the party hostels of Barcelona, Sant Jordi Alberg is the best place for young people who are travelling by themselves or with friends and who want to meet new people and have memorable experiences. Here everything is designed to make sure you enjoy your stay in Barcelona to its fullest. The bedrooms vary in size with 6-, 8- and 10-bed mixed dorms and triple private rooms. They all have good-sized bunk beds with the sheets, pillows, blankets and lockers included in the price. Laundry facilities and towels are also available for a small additional fee. The hostel has a fully-equipped kitchen that you can use day and night, a large dining area, and a comfortable living room with a huge TV, movies, games and books. They also have four computers providing free 24 hr high-speed internet access and free Wi-Fi. Their young and friendly staff speak English and Spanish and will provide you with maps and all the information you&apos;ll need or want – sightseeing, transportation, restaurants, nightlife and more. While Barcelona is famous for its bars, clubs and beautiful Mediterranean beaches, Sant Jordi Alberg is famous for showing you the best of Barcelona and giving you an experience you&apos;ll never forget. Several nights a week they organize special free outings to restaurants, bars and clubs. In addition to all of this they have longboards to rent for your daily surfing pleasure! Pars Teatro hostel, formerly named the Albareda Youth Hostel, is in a great central location near the aquarium, Maremagnum, Barri Gotic and Port Vell and is about 10 minutes walk from the beach. The lovely and friendly staff speak English, Spanish and Portuguese and will always make you feel like you are at home and treat you with the best service possible to make sure that you have the best time in their hostel. This clean and modern hostel is in a safe neighbourhood, next to Paralel metro station and to the port of Barcelona, a great place to explore the city. Around the hostel, you will find some of the best places to go out, with all the hippest and coolest bars, clubs and restaurants. They have recently reopened the hostel with a brand new concept of vintage design, furnished with old and typical Theater objects from different places of the world. The hostel organizes day and night activities most days of the week such as: free walking tours, sangria and cocktail nights, beach parties, open bars, walks to see the sunset from the best viewpoint of the city, family dinners, drinking games, DJ lives and pub crawls. Their bedrooms vary in size with 4-, 5-, 6- and 10- bed mixed dorms all with A/C and heating. They all have good-sized bunk beds with free sheets, blankets and pillows and lockers included in the price. Laundry facilities, breakfast (3€) and towels (3€) are also available for a minimal additional fee. This accommodation is for those who know how to share with other travelers in a happy city without any disruptive behaviour. Come and join the Teatro Family where you can connect with the outside world with their free WiFi and feel at home hanging out in the big lounge, cooking your own meals at the fully equipped kitchen, chatting and meeting like-minded travelers, relax, play guitar or share some beers and stories with your new friends and their friendly staff. At Hostel One Ramblas, the staff works to create a homely and inclusive environment for travelers who are looking to meet people and enjoy the city both during the day and night. Not only do they encourage guests to mix and mingle, they are themselves very friendly, happy, fun, diverse, and here for you. Every evening after their free dinners, you can join the sister hostels for a fun night out. If you are traveling alone and want to meet people, this is the place for you. The common room is large with a fully functioning kitchen. Hang out with your fellow guests on the rooftop terrace, watch movies in the cozy lounge, or take refuge from the hot Barcelona sun. Choose from a 10-, 8-, 6- or 4-bed dorm. Each day, visits to popular attractions in the city are organized at the hostel. The social and friendly environment is perfect for backpackers looking to make friends and go on adventures. Partying with Hostel One Ramblas involves free entry to popular clubs in the city while also skipping the queue!! Breakfast is available every morning until 2pm. Hostel One Ramblas provides free WIFI, computers, laundry services, and tourist information as well.